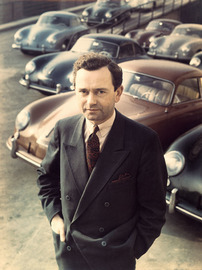 Ferdinand Anton Ernst Porsche, mainly known as Ferry Porsche, was a technical automobile designer and automaker-entrepreneur. He operated Porsche AG in Stuttgart, Germany. His father, Ferdinand Porsche, Sr. was also a renowned automobile engineer and founder of Volkswagen and Porsche. His nephew, Dr. Ferdinand Piëch, is the longtime chairman of Volkswagen Group, and his son, Ferdinand Alexander Porsche, was involved in the design of the 911.